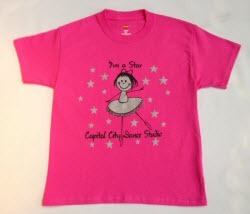 Capital City Dance Studio offers several logo items for both adults and students, including t-shirts, sweatshirts, tank tops, car decals and dance bags. 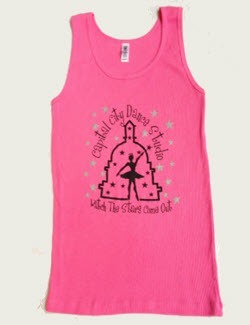 You can order these on this page or pick up an order form in the waiting room of each studio. 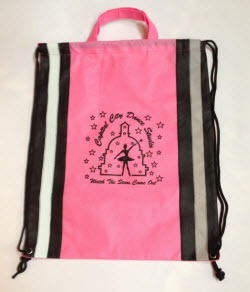 When ordering, you'll be asked to tell us if you want to pick the item up at the studio during your child's next scheduled dance class or if you want us to ship the item to you (tax is included in your price, but shipping and handling fees will apply to shipped items). PLEASE NOTE that if you want to order more than one apparel item, or different sizes, you will need to complete the form for each item separately. To order any of these items, please scroll to the order form at the bottom of this page. We will get back to you. 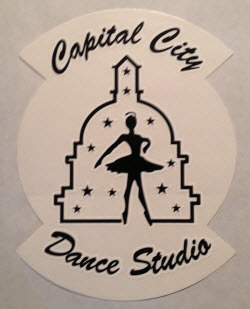 Car Decal -Free: Ask your teacher! 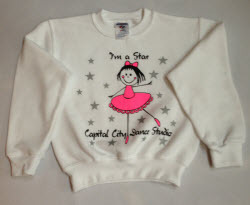 I will pick up my order at my child's next dance class. Please contact me to arrange for delivery.